The sixth edition of the ROSE School Prize, for the second time entitled to M.J. Nigel Priestley and consequently renamed M.J. Nigel Priestley Prize, has been awarded to Professor Anil K. Chopra, on the basis of a unanimous decision of the Selection Committee, with the following motivation. Anil K. Chopra, Professor Emeritus at the University of California at Berkeley, is a renowned leader in structural dynamics and earthquake engineering. His work has had a profound influence on the direction of structural engineering research and practice. Chopra’s research activities have included studies of structural dynamics, various problems in earthquake analysis and design of buildings, dynamic soil structure interaction, dynamic fluid structure interaction, and earthquake analysis and design of concrete dams. His textbook, Dynamics of Structures: Theory and Applications to Earthquake Engineering, 1995, 2001, 2007, 2012, and 2017 is the most highly regarded and internationally translated textbook in the field of structural dynamics and earthquake engineering. It is considered a must-read book for everybody working in seismic analysis. There is no other book of comparable breadth, detail and quality in the field. The book has been translated into Japanese, Chinese, Korean, Greek, Turkish, Spanish, and Farsi. Chopra’s pioneering work on concrete dams and intake-outlet towers set the direction for much of the subsequent research. Starting with the earliest application of the finite element method to dynamic analysis of dams, he and his students developed rigorous methods for the analysis of the earthquake response of concrete dams, including the effects of fluid–structure and foundation–structure interaction. These methods and computer programs have been widely used in engineering practice. Chopra is known also for pioneering work on several aspects of dynamics of buildings that influenced the direction of research and was incorporated in analysis procedures for estimating seismic demands on buildings. Chopra’s work in the field of pushover analysis resulted in a significant revision of the Federal Emergency Management Agency’s professional guidelines for seismic evaluation of existing buildings after he demonstrated deficiencies in these guidelines. Throughout his career, Chopra has been responsible for the development and teaching of courses in structural engineering, structural dynamics, and earthquake engineering at the University of California in Berkeley. Chopra has served as Associate, General and Executive Editor of Earthquake Engineering and Structural Dynamics -the official Journal of the International Association for Earthquake Engineering- for almost thirty years (from 1988 until present). Under his skillful leadership, the journal has kept its image of the premier international journal in the field all the time. As a consultant on earthquake engineering problems to numerous governmental and private organizations in several countries, Chopra contributed to the transfer of research achievements in the practice and to seismic resistance of several important structures worldwide, including the structures at Panama Canal. Anil Chopra is a giant in earthquake engineering and his association with the award will continue the tradition of highest distinction that characterized the previous editions. 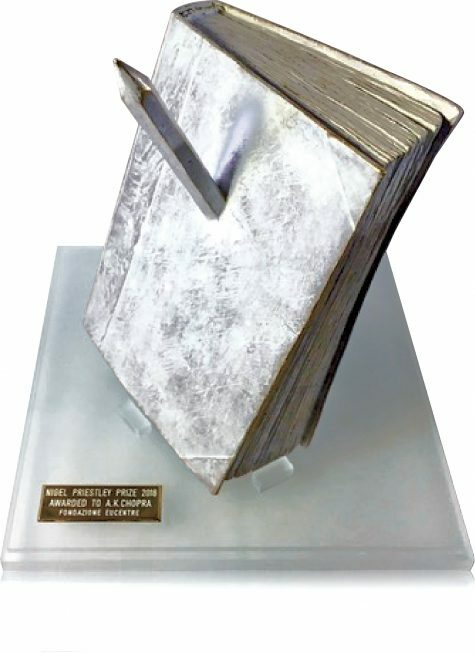 The second edition of the Nigel Priestley International Prize is a bronze work by Lorenzo Perrone.